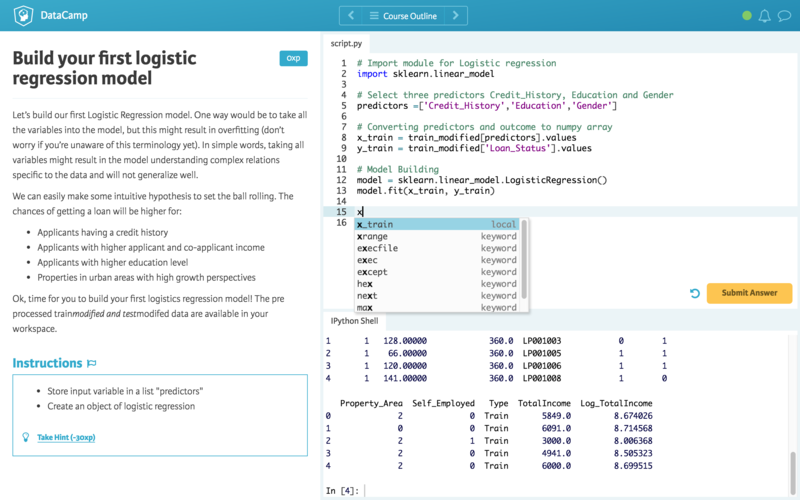 The DataCamp team is excited to announce a free course from our friends at Analytics Vidhya. This course begins with an introduction to Python detailing everything from the importance of Python for data scientists to best practices for improving model performance. The course serves as an introduction and offers more detail about the basic syntax and data structures of Python, like lists, strings and using Python libraries. After getting a feel for the language and syntax, the course presents exercises on data exploration, data manipulation, and building predictive models. Once you have completed this course, you will be better equipped to participate and compete in the data science hackathons that Analytics Vidhya frequently conducts here. So don't wait and get started and sharpen your data science skills! Want to see other topics covered as well? Just let us know on Twitter. Would you like to create your own course? Using DataCamp Teach, you can easily create and host your own interactive tutorial for free. Use the same system DataCamp course creators use to develop their courses, and share your Python knowledge with the rest of the world.